This site was made in 2012 to celebrate 100 years on this street. It is updated occasionally. 1912 was an exciting time in Calgary. The first Stampede was held. The Calgary Public Library opened. Early photo of first library here. Natural gas arrived by pipeline to supply homes and businesses. Calgary Power was generating electricity. By 1912, Calgary's population had exploded more than 10-fold over the previous decade - from 4,091 in 1901 to 50,000 in 1912. (See Earle Gray's blog entry Calgary goes from cow town to tame town.) Our neighborhood, called Westmount (or Westmont), was annexed by the City of Calgary in 1910 - only 27 years after the buffalo disappeared from the North American plains. Originally our street was Third Avenue SW and Kensington Road was Centre Avenue. Its name was changed to Broadview Road NW around 1928. For an interesting history of the area see Hillhurst - Sunnyside Remembers by Margaret Tanko, 1978. In 1912 there were 17 houses in the 1600 block of what is now Broadview Road, of which 15 remain. Now, 101 years later, there are 37 houses and 5 new ones coming. Many of these houses had suites at one time or another, possibly due to housing shortages in Calgary's boom and bust economy. Who lived here? Click a house photo or number to find out. If your house was built before 1930, these photos might show what it looked like inside back then - Domestic Architecture 1920s. Houses built in 1912 or earlier may have had electricity. From what I've seen in our houses, these early homes were wired for electricity when built, and probably had bathrooms equipped for running water, although they may not have been connected to water and sewage mains yet. It seems unlikely they had natural gas service. Natural gas arrived in Calgary on July 17, 1912. Here are ATCO Gas centennial stories. Furnaces, if the house had one, would have been large, either gravity or water heat (radiators). If there was no natural gas service here, they would have been fired with coal, oil or wood. Have you found evidence of a coal chute or coal storage at your house? In 1910, "a serious outbreak of typhoid occurred in in the poorer sections of Calgary where, lacking connection to the water and sewer mains, people got their water from back yard wells polluted with seepage from outdoor privies and cesspools." Hopefully Broadview Road was not part of the poorer sections. (from Homes in Alberta: Building, Trends, and Design by Donald G. Wetherell and Irene R. A. Kmet, ©1991, page 51) Even cholera occurred in Alberta in the early 1900s due to poor sanitation. In 1912, horses would still be seen on the streets. Ladies wore floor-length dresses. Milk, cream and butter were delivered to your home by a horse and wagon. Interesting Calgary photos, taken in 1912-1913, are in the Thomas H. Mawson Collection on the University of Calgary website at http://caa.ucalgary.ca/mawson. When two residents names are shown on this website, it may mean suites (especially if a long time ago) or it may just mean people with different last names lived there (especially in more recent years). Our neighborhood was originally part of the CPR main line grant. 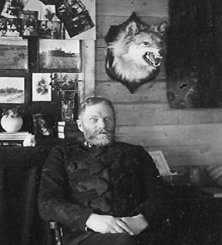 In 1881, in exchange for building the railroad, the Canadian Government promised to give the Canadian Pacific Railway 25 million acres in the Northwest Territories (now Manitoba, Saskatchewan and Alberta) in a belt 24 miles wide on each side of the CPR railway tracks, as well as $25 million and 713 miles of existing railroad. 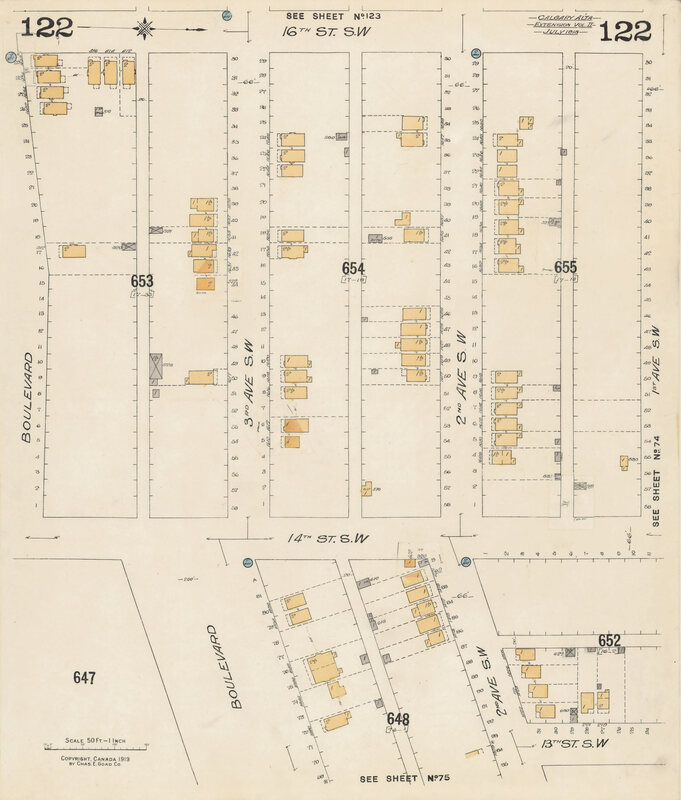 On May 16, 1901, Lawrence W. Herchmer of Calgary purchased, from the CPR, the north 1/2 of Section 17, Township 24, Range 1, west of the 5th Meridian for (150.9 acres) for $15 per acre. 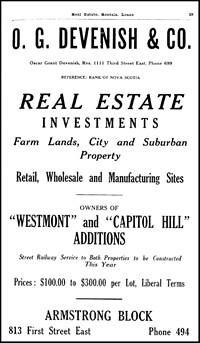 The CPR land records read "All land north of Boulevard". (I think Boulevard is now Westmount Boulevard.) I did not research the land from then until it was annexed by City of Calgary in 1910. * indicates home owner -started in 1934, stopped by 1943, back again in 1949.